Casablanca-based Royal Air Maroc announced on Wednesday that it is joining the oneworld alliance, the airline alliance which includes British Airways. oneworld is one of the three global airline alliances, with other two being Star Alliance and SkyTeam. This gives the oneworld alliance an African member for the first time, if you don’t count BA franchise Comair. Star Alliance already has Ethiopian and South African in its ranks whilst SkyTeam has Kenya Airways. Once it becomes a full member, you will be able to earn British Airways tier points and Avios, as well as spend Avios, on Royal Air Maroc flights. This is not scheduled to happen until mid-2020, however, as substantial IT work is required to get the partnership in place. Royal Air Maroc Express, the regional subsidiary, will become an affiliate member of oneworld. 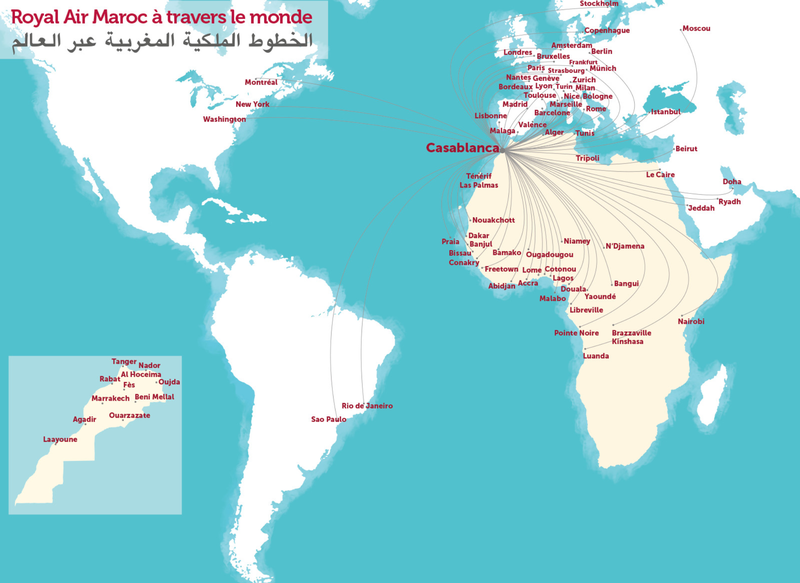 oneworld will have 14 members once Royal Air Maroc is integrated. As well as BA, the other airlines involved, on which you can already earn and spend Avios, are: American Airlines, Cathay Pacific, Finnair, Iberia, Japan Airlines, LATAM, Malaysia Airlines, Qantas, Qatar Airways, Royal Jordanian, S7 Airlines and Sri Lankan Airlines. Fiji Airlines is also joining as a looser ‘oneworld connect’ member. The airline flies to 94 destinations in 49 countries, carrying 7.3 million passengers per year on a fleet of 55 aircraft. Long-haul routes include New York, Washington, Montreal, Rio de Janeiro and Sao Paulo which primarily use new Boeing 787-8 Dreamliners. 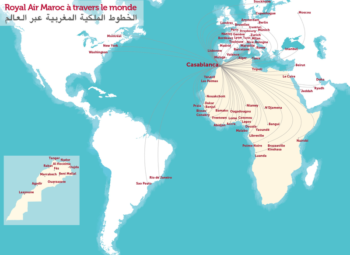 You can connect from Manchester, London Heathrow and London Gatwick via Casablanca. The real benefit, though, is the addition of numerous new African destinations to the oneworld route map. The alliance gains 34 new destinations and a surprising 21 additional countries. The addition of Royal Air Maroc will also allow you to earn Avios and tier points on flights to Casablanca, a route no longer offered by British Airways. One thing remains a mystery …..
Two years ago, Royal Air Maroc announced that it was adopting Avios as the currency of its Safar Flyer loyalty programme. Since then ….. radio silence. I have no idea if this deal is now dead or not. Overall, whilst this isn’t an airline I can see myself using in the short-term, it is a good addition to oneworld and adds some valuable new destinations to the network. You can find out more about Royal Air Maroc on its website here. They have no flights to Addis Ababa in Ethiopia? Shocking! I was wondering how long this would take! Africa’s first high speed rail opened last week from Casablanca to Tangier… for those who like that sort of thing. Rabat is a fascinating city too and not too far away. It would take more than a few Avios/Tier Points to get me on RAM. I do some work with an NGO in West Africa & despite being one of the few airlines with decent regional coverage we are forbidden from using them due to a catalogue of issues with lost baggage & misconnections where people have been abandoned. Anyone who complains about the state of BA CS has a real treat in store! Rob, fyi, still getting desktop view on iPhone over 50% of the time. Do you not have a “view mobile site” link at the very bottom? The hosting company told me yesterday that they think they can fix it. Basically, it is a joke. The new hosts use cache more extensively than usual, eg instead of fetching a new page each time it is requested it simply sends out a copy of the previous request (every 30 seconds it does update). The problem is that it is failing to differentiate between mobile and desktop in some cases. So, if your request triggers the ‘update every 30 seconds’ action and you are on a mobile, it will serve a mobile page for the next 30 seconds to everyone. Except …. on desktops it is always serving the correct version. Which is odd. Anyway, they claim a fix is very close. If not, we will dump them and switch host again although I’d rather not. What isn’t clear is why one of the biggest WordPress hosting businesses in the world has this issue. Is it maybe an iOS issue? I always get desktop version on desktop and always get mobile on my Android phone (Chrome for both). Works flawlessly. Email alerts also working perfectly so please don’t move host! OT – Amex plans to open Centurion lounge in Heathrow. If BA’s IT people (outsourced to the lowest bidder) have to get involved the date will be more like 2030. Not really a like-for-like replacement of Qatar !! Is Qatar leaving OW as well as OPEC? Slightly OT – this still does nothing for the UK regions! I was looking at which One World partners fly abroad from MAN on any kind of regular basis as I am toying with planning Christmas markets trip for next year – the only direct option would be Helsinki with Finnair! I dont think UK regions are a OW priority. As I am sure you are aware, there are lots of good cash options from MAN or LPL. Until HfP take us seriously OW won’t. We just came back from the Helsinki on Monday and the Xmas markets weren’t great. We did Munch 3 years ago and they were much much better. Helsinki was mainly food, woolly socks, gloves and hats and wooden kitchen utensils. Found one lovely shop with a Xmas shop in the basement where we managed to get a few nice decorations. Our trip was postponed from Sept so was never meant to be a Xmas market trip. Also did Tallinn and the market was much the same. Also not one shop had a sale on so everything full price till after Xmas – no bargains to be had. I went to Salzburg one Christmas, arriving on boxing day and found the markets being packed up. I asked a trader why they were packing up and he explained that Christmas was yesterday – so no more Christmas market! Enjoyed the Berlin Christmas market, and the boxing day sales there were good. Sun Air fly from MAN to BLL (Denmark), normally an expensive flight (£200+), my stepfather always enjoys his flight with them. These are the ones i know of, hopefully we have more? There is an excellent Christmas Market in Manchester. We usually combine that with a night in the Hilton. Tick that box beforehand and you can take another OW Carrier further afield east or west. Manchester is my home town so would like something a bit more exotic! It would be nice to have more options to earn avios and tier points generally. BA flights to Europe only operate at weekends during the summer months, so are useless for short breaks or holidays at Easter or half term. There doesn’t seem to be much in Billund, I don’t know if they have Xmas markets? Cathay Pacific to Hong Kong (and on from there). Qatar to Doha (and on from there). AA to PHL and others (and on from there). Plus BA and IB, is really the 5 biggest oneworld airlines all serve MAN. Really not that bad for a regional airport! I don’t really class MAN as “regional” as it has 3 terminals and is the biggest UK airport outside London. And despite the routes served by AA, a lot of northerners still travel to the US via LHR because prices from MAN are so high. If you leave in the regions, trying to get status is pointless – it will be such a waste of time. nevertheless, keep earning Avios though (or other ffp miles/points). Use the advantage of choosing the cheapest (or nicest? affordable? quickest?) available option, instead of alliance airlines deciding where you have to go. Yep must say I’ve stopped retaining BA Gold now – with the doubling of RFS cost there’s no benefit in choosing BA over LCC for short haul and for long haul I’m either paying for C or redeeming for C/F so get the majority of the benefits. I’m pushing more to acquire hotel points as I’ve found them better for availability and of even greater value given the weak GBP. I’ve started shifting my strategy to hotels and accommodation as well. Flights have gotten cheaper (while redemption fees more expensive), while Hotels are getting more expensive. What doubling of RFS cost ? Have I missed something ? If I use an Airline scheme to ‘buy’ flights I am flying in a class that has all the benefits I need. If I am just looking to hop somewhere direct I’ll buy on price, invariably with an airline where status is meaningless but I’ll go where I want, when I want. Lounge access can be obtained many ways. Hotel points are proving much more useful and this is the vast majority of my collecting and status chasing. Which is great if you CAN go when you want! If you have to travel in the school holidays there is no such thing as an LCC, you’re paying £300-400 pp for a flight to mainland Europe or the Canaries but getting the same product as when that flight costs £100 in term time. If I’m paying that price I really like to have some kind of return on it (apart from the precious family holiday, obviously!) Now either Ryanair or Easyjet (can’t recall which) are taking Amex I might re-visit them when they provide the most direct route to where I want to get to! I travel in the school holidays. Increased demand equals increased price. Same will be true of your hotel. And everything else. We still use Center Parcs. That makes my wallet bleed but I’ve given up looking at term time prices the week before we go. It would mean we never went anywhere. “Star Alliance already has Ethiopian and South African…” and EgyptAir? No, I did think about this. Technically, Egypt is in BOTH Asia and Africa whilst also being a Middle Eastern country. I decided it didn’t really count as ‘Africa’ on that basis. What a BS explanation – Middle East is not a geographical separation based on continents (there is actually some middle east in europe as well). The majority of Egypt’s mass and population is in the African continent. Spain is in both Europe and Africa – so applying your logic… we can’t consider Iberia an European airline either. Anyway, according to Rob, if you are flying with EgyptAir you are not flying an African airline. LoL. @marcw I actually get Rob’s reasoning. I view the Middle East as it’s own separate area, almost like a mini-continent. I would put Egypt as an African country personally, but Israel next door as Middle East. Where do you draw the line… Maybe a personal decision? After all, Israel won the Eurovision Song contest! It is very difficult to draw a line, I agree. But we can argue whether Egypt is or not a Middle Eastern country, but it is an African country. Culturally they may be different from all other African countries and perhaps more linked to the traditional Middle Eastern culture. But that doesn’t imply that they are not an African country. We could use geological features to separate regions (because humans love to classify, separate everything). Tectonic plates and major geological structures has been used to separate regions traditionally (and, in fact, countries). This should be the most objective way of separating regions, which is as system (I think) the UN nations uses. The problem is, with time and history, politics and geopolitics get involved and mess up everything, and now even the MENA region exists. Furthermore, using Middle East (or Near East or Far East) is very egocentric, as if Europe (or UK for that matter) is the center of the world. Perhaps we should ask Egyptians whether they feel Africans, Middle Eastern, or both. Any Egyptians around? This is a terrible airline, I flew them once to Gabon, via Morocco. I can’t see 21 new countries on that map. Nor can I see connections from Manchester. Something not quite right here. I wonder if RAM could be an alternative to Iberia and the defunct Air Berlin for getting from Germany/Switzerland to the Canaries. RAM only flies to Gran Canaria and Tenerife North. I think no airline offers such an incredible good network to the Canaries like Iberia/Express. Notably, Air Berlin had a fantastic network there with incredibly good redemption options. Nevertheless, in low season a cheap Ryanair/easyJet/Laudair … should get you there for peanuts. I flew RAM from MAN-Casablanca in Sept and credited Iberia earning Avios. Lovely flight and auto credit with no hassles. Was cheap, 1st bag included. I’d recommend them every day. Used TAP via LIS on the return, that was a different story. If I can fly on miles via RAK to the rest of Africa on Avios that opens up a huge redemption opportunity for me. Flew RAM last year via Casablanca to Fez and it was a little bit of a third world experience… I won’t be jumping on that wagon again. Flights can be credited to Iberia to get (some) Avios in the meantime. Worked for that airline on a couple of occasions, and had a couple of onsite visits there. I’d rather go via CDG on AF or even IST on TK just to avoid that airline again.